A test venue for many years, the Circuit de Catalunya is one of the ultimate performance benchmark tests for any single seater, F1 being no different. The long sweeping corners and quite abrasive track surface mean that both aerodynamic and tyre management characteristics are exposed to near maximum and it is for this reason that the teams opt to bring plenty of new parts for a laptime gain heading into the next 4 months of – barring Canada – European races. I must admit that as I looked through the various technical galleries on Thursday, I was a little disappointed. Much had been said of the importance of this weekend for the championship and teams such as Lotus, McLaren and Caterham suggested that their cars would see drastic overhauls in a lot of key areas. This was, sadly, not the case although, as you are about to find out, a bucket load of tech still made its way to the cars up and down the grid. All customer teams are behind the development curve of the manufacturer teams and McLaren are no different. Just before testing began, Mercedes provided its customers with an updated log-style exhaust manifold which hugs much closer to the power unit in place of a much more traditional multiple header format. McLaren designed its sidepods around the old layout which resulted in a more bulky shape. One mechanic described the space left between the sidepod and the new manifold as “the size of a suitcase” – a lot of space! For Spain the team addressed this by repackaging some of the components aft of the radiators and tapered in the sidepods, clearing up the path for airflow to reach the central section of the diffuser through the ‘Coke-bottle’ section. A slightly reprofiled diffuser was also visible on the MP4-29, its design following a similar path to a philosophy founded by both Red Bull and Lotus over the past few years. 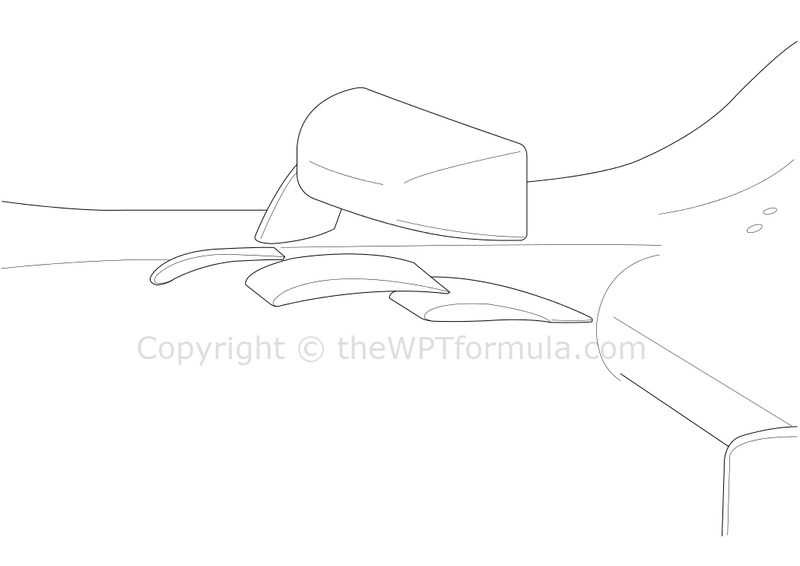 The shoulders/walls of the diffuser droop gently downwards, with the overlapping gurney tab above following suit. The outer regions are angled and extended to the rule’s extremities to increase outwash as well as upwash, the combined effect creating better expansion at the rear of the car and boosting downforce. Aiding airflow management around the front tyres were a new pair of front brake ducts. The inlet aperture itself is much smaller than its predecessor and tear-dropped but the guide vane now tightly hugs the tyre more than any other design on the grid. It is so tight that it overlaps the tyre at the top, forcing air around the inside of the tyre rather than hitting it square on. This should improve aerodynamic efficiency and optimise components downstream. Aiming to maintain or increase the gap, Spain was an important weekend for the Silver Arrows. Evidently there were no such worries of the opposition closing in over the weekend but updates have kept the W05 well ahead of the game. Their front wing continues to evolve with a plethora of interesting changes to manage airflow and create downforce simultaneously. An extra, smaller element has been installed on the third plane, whilst the cascade winglet’s support is now dog-legged (1) and minimally reprofiled. A vane has been placed behind the cascade on the inner face of the endplate (2) and three slots (3 – one visible in this image) added to the footplate. 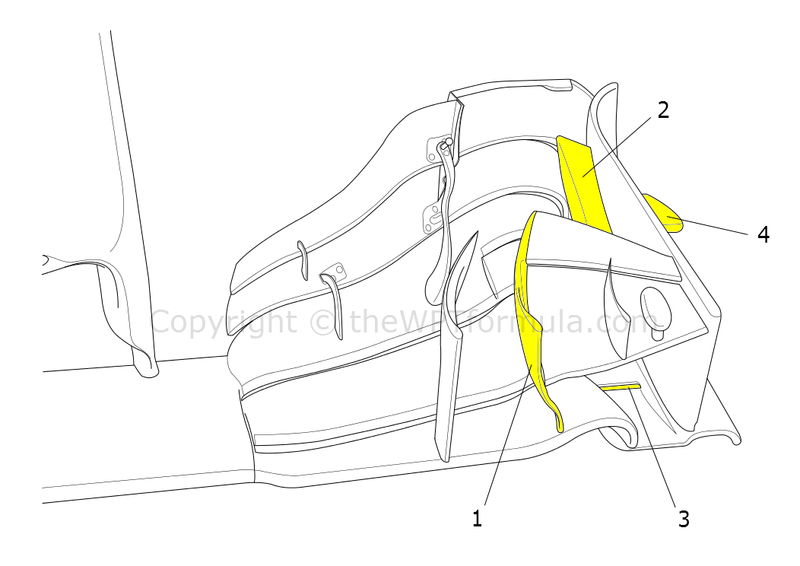 The slots should prevent vortices building up at the base of the tyre, an area only Ferrari have properly addressed over the past two years or so. Finally, the pressure gradient vane on the outside face of the endplate (4) has been reprofiled to optimise the effect of the vortex shed from its trailing edge. The sidepods were extensively modified, taking major design cues from the Red Bull RB10. The hot air ‘canon’ outlets that were previously placed ahead of the rear suspension elements have now been pushed further back, exiting just above the top of the diffuser. In the same manner as the RB10, the bodywork has been extended and wrapped around the rear suspension to optimise airflow passing through the ‘Coke-bottle’ region. The changes should reduce the disturbing effect that the expanding hot air has on the airflow passing over the rear of the car. Identifying that downforce is the main priority over top speed this weekend, Red Bull decided to change the rear wing endplate louvres back to an older specification to increase rear downforce. The new louvres introduced in Australia reduce drag by disrupting the low pressure area beneath the wing – rather than the conventional method of extracting high pressure air above the wing – which subsequently loses downforce but reduces drag a little more. Considering that Renault brought new software maps to increase horsepower and driveability from both the ICE and MGU-K, this change isn’t too surprising. Red Bull also received, along with Lotus, a new fuel from Total which aimed to increase overall power output. The Renault-powered cars appeared to be moving higher up the speed trap order across the weekend so progress is being made in all areas that’s for sure. The slots in the floor ahead of the rear tyres were also updated, yet another cut-and-paste effort where the mechanics have simply stitched in a new piece of floor without a total rebuild. The update aims to further disband tyre squirt heading into the diffuser at speed, increasing the efficiency of the floor. The Grove-based outfit concentrated more on internal changes than visible parts, particularly on the mechanical front as rear tyre degradation continues to hurt them slightly. Sadly, the team swapped out the lovely elongated wing mirror mounts for a much more traditional layout, complete with an array of vortex generating devices tucked in beneath. The changes will have been prompted by a desire to re-orientate the position the vortices projected over the sidepod, thus inducing a slightly different aerodynamic effect at the rear of the car. A new floor was brought to Barcelona, complete with a pair of serrated bargeboards plus a secondary overlapping vane as a compliment. 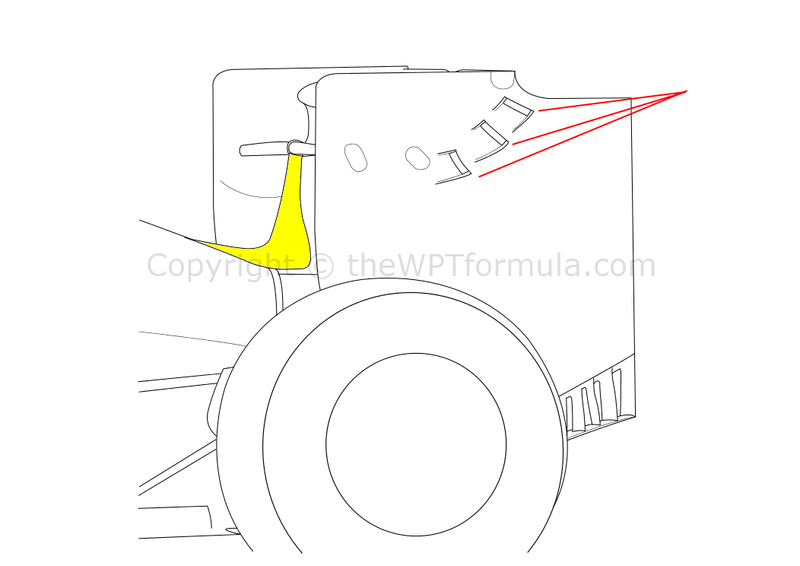 Again, these changes are designed to improve components downstream rather than produce downforce in their own right. Sharing much of its design from this year’s McLaren, this revised rear wing mounting pylon should improve rear grip slightly, particularly at high speed. Dubbed as ‘Y-lon’, the single vertical element attaches to a ‘U’ shaped based, forming an inverted ‘Y’ shape. Mounted to the lower area is the updated Monkey Seat winglet which utilises the upwash of the exhaust gases to boost rear downforce. The exhaust pipe itself is shrouded in this format, thus protecting the gases from the effects of yaw and pitch. The pylon utilises a ‘swan neck’ mounting system. The term comes from the fact that the vertical element bends over the top of the wing and attaches the the upper surface rather than the base of the wing. This is better because the more important low pressure area beneath is less disturbed by the blockage of the pylon. What’s interesting about this design is the fact that Ferrari have deliberately decreased the rear wing’s chord length to enable this design. After the ban on full shark-fin engine covers in 2012, a regulation was created such that bodywork was not permitted on the rear wing’s central section barring the DRS actuator. 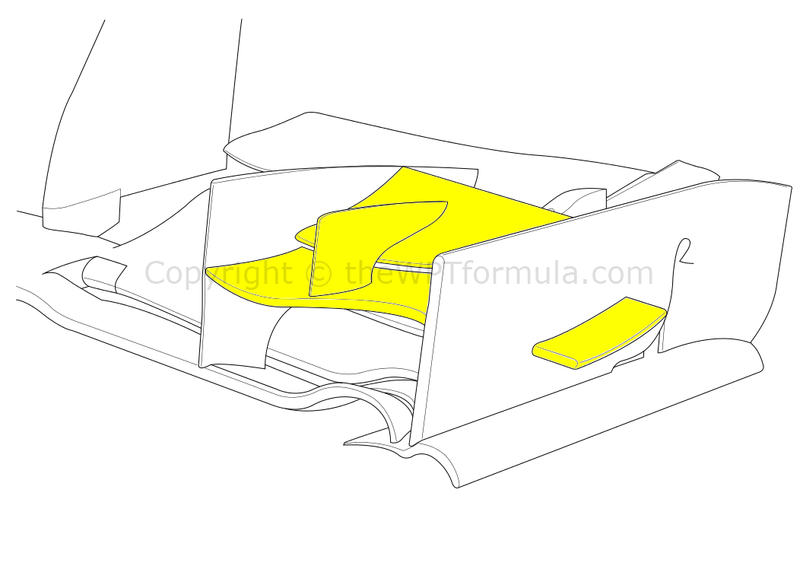 However the rules encompass a square shaped area above the rear portion of the car rather than on the actual rear wing itself, so reducing the length of the wing has allowed the team to squeeze in the swooping ‘neck’. The front brake ducts now have a triple element design at their base, replacing the previous single element, to manage airflow. A new front wing was tested in Free Practice but did not make it to the race itself, which featured a much flatter leading edge with less of a curve down to the footplate at its outer edge. Reducing weight was the number one priority for Sauber and they’ve done a very good job considering their budget, shedding some 10-15+kg from the C33 in under three weeks. The weight saving process was accompanied by a completely new sidepod layout – now much slimmer and featuring more traditional triangular inlets (rather than square) – and the above front wing changes. The dual element cascade winglet is now gone and in its place a much more simplified, larger winglet including a guide vane. 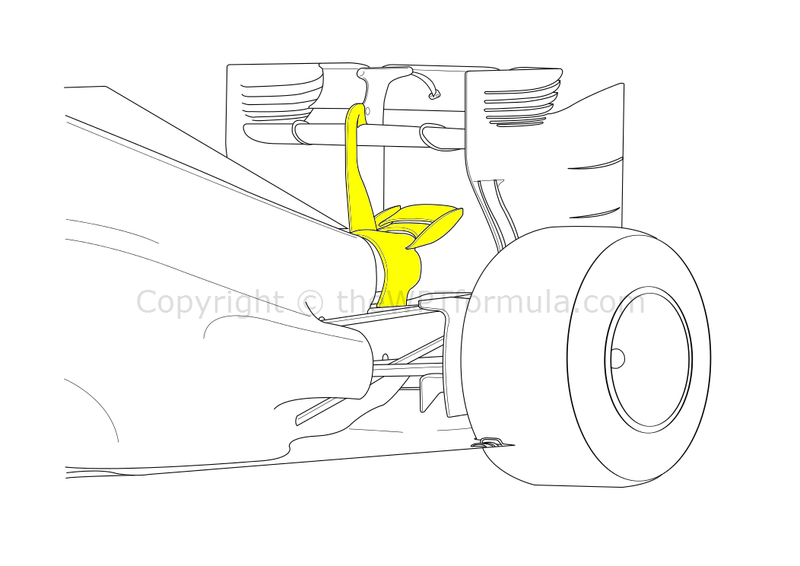 A pressure gradient vane has been added to the endplate, a design very similar to that seen on the McLaren and having the exact same effect. Along with the upgrades from Renault and Total, Lotus finally added a little Y100 Monkey Seat winglet above the exhaust exit. As their rear wing pylon is bent around the offset exhaust, the winglet has been strategically placed via an intricate mounting device which bonds directly to the pylon itself. 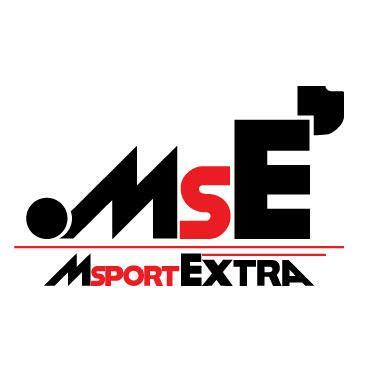 This entry was posted in 2014 Highlights, Technical Highlights and tagged 2014, analysis, barcelona, f1, ferrari, highlights, mclaren, mercedes, mirrors, sauber, spain, tech, williams on May 11, 2014 by thewptformula.